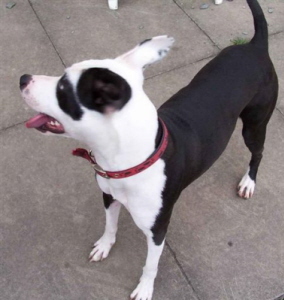 Wendy is between 12 and 18 months of age, and the most beautiful Staffie X Whippet. Currently in foster care in Rochdale, Wendy is looking for her very own new home! 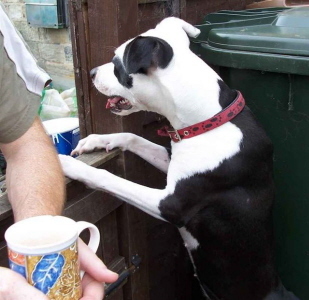 Wendy is sharing her foster home with the carer's own dogs, and has proven to be dog friendly. She is also extremely good with children and would love to share a family home, although our usual criteria for all homings applies (ie: children 7yrs +). We do NOT know how she would be with cats, and do not have the facilities to test this at this time, so would be looking for a cat free home. This little girl is just stunning, with fantastic markings and a very pretty face. 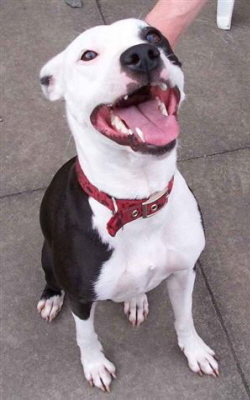 She has a playful and active personality, and loves her toys, walks and cuddles. 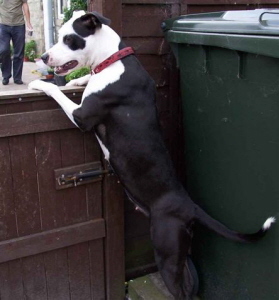 However she has been known to clear a 4ft fence, and so we would be looking for 5ft minimum for adoption purposes. Wendy is house-trained, not destructive when left for short periods, and is a good traveller. She already knows several commands, including sit & give paw, and has good recall once she has bonded with you. Wendy is wormed, flea treated, micro-chipped, spayed and vaccinated. Anyone interested in homing Wendy needs to contact us or telephone Margaret on 07946 739038 for an informal chat. If successful an adoption contract is completed and a donation is usually required. The dog will be neutered or spayed where possible, vaccinated and microchipped.